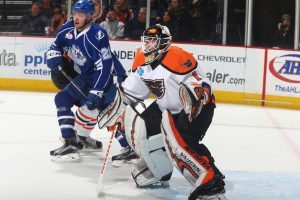 Lehigh Valley, PA – Corban Knight (6th), Danick Martel (16th) and Chris Conner (5th) all notched a goal and an assist Saturday evening as the Lehigh Valley Phantoms snapped the Syracuse Crunch’s 10-game winning streak with a 4-2 win in front of 7,113 fans inside PPL Center. With the win, the Phantoms improved to 17-9-1-2 overall this season as Lehigh Valley has now claimed five of its last seven games in downtown Allentown. The Phantoms have enjoyed a true home-ice advantage so far this season as Lehigh Valley is now an impressive 9-3-1-1 when skating at PPL Center this year. Syracuse hadn’t been handed a setback since a 3-1 loss at the Toronto Marlies back on November 19 and had outscored its opposition 47-22 during its 10-game run. 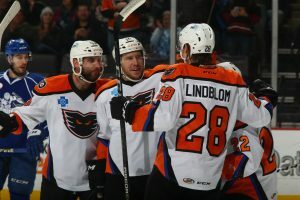 But that all came to an end Saturday evening as the Phantoms excelled in all areas of their game in earning a hard-fought victory against one of the AHL’s hottest club. Martel’s goal was his league-leading 16th conversion of the year as the third-year winger produced his sixth multi-point effort of the season. Meanwhile, Knight’s multi-point outing was his fifth such effort of the year and his fourth in eight December outings. The 27-year-old center has been scorching hot of late as he’s converted five goals, nine assists and 14 total points across his last 12 games. Finally, Conner’s multi-point night was also his fifth such outing of the season as the 33-year-old winger has now compiled 130 career points (43 goals, 87 assists) in 155 total games with the Phantoms. Grey Carey capped Lehigh Valley’s scoring on Saturday with his 15th goal of the season. The 27-year-old winger has now converted 10 goals and 12 total points over his last 12 games as he and Martel remain atop the AHL’s goal-scoring list. Carey’s conversion was a power play marker as Lehigh Valley scored on the man-advantage for the third straight game. The Phantoms have now poured in four power play tallies during that stretch going 4-for-14 with the extra attacker this week. Meanwhile, the Phantoms’ penalty kill successfully thwarted each of Syracuse’s four power play opportunities on the night. Goaltender John Muse earned the victory between the pipes for Lehigh Valley with a strong 22-save performance. Since being recalled from the Reading Royals of the ECHL, Muse is 2-1 and has allowed just six goals in nearly 170 minutes of action this week. Syracuse opened the scoring late in the first period when a sizzling one timer by Martel was fought off by Crunch goaltender Connor Ingram leading to a transition rush the other way. After Matthew Joseph carried the puck in along the left wing, he dropped it to a streaking Matthew Peca who uncorked a slap shot into the upper right-hand corner of the Lehigh Valley net for his fourth goal of the season. Joseph and Erik Cernak assisted on the even-strength strike netted 17:53 into the opening frame. The Phantoms leveled the tilt just past the midway of the contest when Varone touched a brilliant pass from the right wing corner to the top of the goal crease where Conner deftly deposited his fifth goal of the year. Martel collected the secondary assist on the five-on-five conversion tallied 11:44 into the middle stanza. Lehigh Valley then claimed its first lead of the night just over three minutes later when Knight expertly redirected Will O’Neill’s snap shot from the left point for his sixth goal of the season. O’Neill and Nic Aube-Kubel assisted on the even-strength tally converted 14:48 into the second period. The Phantoms then doubled their advantage less than two minutes later when, while on the power play, Carey was able to back hand home his 15th goal of the year. Conner and Oskar Lindblom assisted on the man-advantage marker scored 16:32 into the second period as Lindblom extended his point streak to four consecutive games. The 21-year-old winger has now tallied two goal, two assists and four points over his last four outings. Syracuse sliced Lehigh Valley’s lead in half with just over seven minutes left in regulation when Kevin Lynch landed his seventh goal of the season but the Phantoms bounced right back and re-established their two-goal lead for good just over a minute later when Martel expertly converted a two-on-one with Knight for his 16th goal of the season. Aube-Kubel collected the secondary assist on the game’s final conversion as the second-year winger garnered his third multi-point outing and seventh point overall over his last five games. The Phantoms cap this week’s action on Sunday when the team travels to Webster Bank Arena in Bridgeport for a 3:00 p.m. clash with the Sound Tigers. 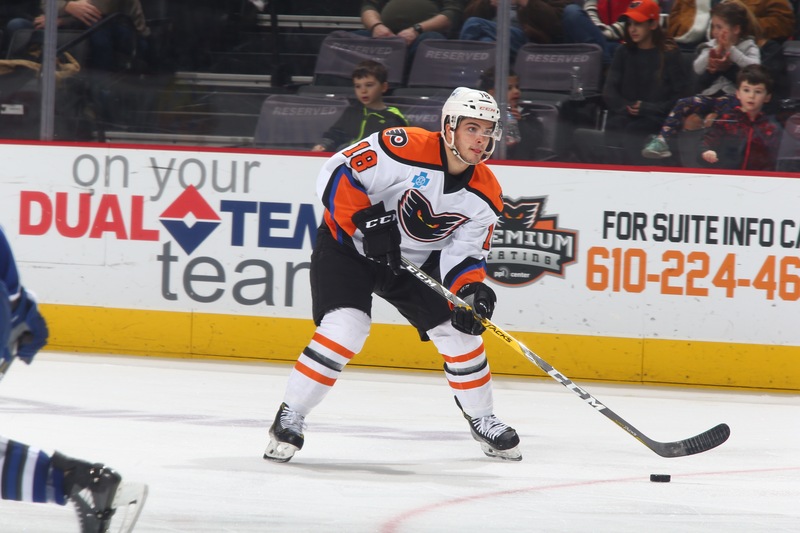 Lehigh Valley is then back at PPL Center this Wednesday, December 20 when the Phantoms play their final home game before the holiday break as they welcome the Hartford Wolf Pack, AHL affiliate of the New York Rangers, to downtown Allentown. A limited number of tickets remain for Wednesday’s game and can be purchased online HERE.